With all the doomsday fanatics and psychics predicting the end times, different interpretations of the Bible creating wild speculation, and pop culture spinning a story full of dark drama and fear what do we do and where do we go? In Last Things Revealed Dr. Jim Dixon addresses these issues thoughtfully and carefully from his years of experience teaching on these subjects. As a passionate teacher and historian, he weaves in history, historical terms, and current events to back up each lesson from Scripture. 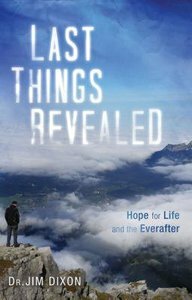 While other books tend to focus only on what the end times will look like, Dr. Dixon goes back and looks at relations between important people groups that he feels will have a significant story in the times to come&mdash;such as Islam and Israel. He looks at what we can learn from events and people in the Bible that are like stories out of the headlines of today's news, leaving us with a both a deep understanding and hope as we live forward with confidence. Jim Dixon (D.Min., Fuller Theological Seminary) is founding and senior pastor of Cherry Hills Community Church. Dr. Dixon has become a respected scholar and teacher. Because Jim is also a history buff and movie fan, his messages are peppered with interesting anecdotes and movie clips to help translate Gods truth from the Bible to the present day. Atheist-turned-Christian, Lee Strobel is the former award-winning legal affairs editor of The Chicago Tribune. He holds a Master of Studies in Law degree, as well as a journalism degree and was a professional journalist for 14 years, winning Illinois' top honours for investigative reporting and public service journalism from United Press International. In 1981, after a two-year investigation of the evidence for Jesus, Lee received Christ as his Saviour, and subsequently became a teaching pastor at two of America's largest churches - Willow Creek Community Church, Chicago in 1987 and Saddleback Valley Community Church, California in 2000. In 2002 he left Saddleback's staff to focus on writing. A New York Times best-selling author of nearly 20 books, he has been described by the Washington Post as "one of the evangelical community's most popular apologists." His journey from atheism to faith has been documented in the Gold Medallion-winning books The Case for Christ, Inside the Mind of Unchurched Harry and Mary and The Case for Faith. His other best-sellers include Surviving a Spiritual Mismatch in Marriage, which he co-authored with his wife, Leslie; God's Outrageous Claims and What Jesus Would Say? Lee also shared the prestigious ECPA Jordon Christian Book of the Year award in 2005 for a curriculum he co-authored about the movie The Passion of the Christ. Lee is also co-author of the Becoming a Contagious Christian training curriculum, which is used around the world. And his articles have been published in a variety of magazines, including Discipleship Journal, Marriage Partnership, The Christian Research Journal, Guideposts, and Decision. He is also a contributing editor and columnist for Outreach on-line magazine. Lee and Leslie have been married for 33 years and live in Southern California. They have a daughter, Alison, and son Kyle who is married to Kellie, both Alison and Kyle are writers.